Perhaps the differentiator between cao lau and other noodle dishes is the texture. Cao lau noodles are firmer and chewier - very similar to Japanese udon - than those found in typical Vietnamese noodle dishes such as pho. Why can't cao lau be made anywhere else in Vietnam? The secret lies in the water; authentic cao lau is prepared only with water drawn from ancient Cham wells hidden around Hoi An and Quang Nam Province. Noodles are pre-soaked in well water and lye made from wood ash brought from one of the eight Cham Islands around 10 miles outside of Hoi An. The combination may seem esoteric, but local foodies can tell a difference in the taste and texture! Cao lau literally appears on every menu around Hoi An - both in the Old Town and on streets outside. With every eatery in town advertising some interpretation of the dish, finding authentic cao lao can actually be daunting. Many restaurants leave out key ingredients or do not use well water; some places are cheeky enough to use pho broth thinking that tourists will not know the difference! Despite the preparation time, cao lau is usually cheap to eat - under $2 a bowl. Although cao lau is served in most restaurants until close, locals prefer to eat the dish either for breakfast or lunch, giving plenty of time to digest the firm noodles. Tradition claims the only true way to enjoy cao lau is to eat it on the second floor of a restaurant, just as the traders did hundreds of years ago. Your height above sea level won't have much bearing on the delicious taste, but looking out over the same river while enjoying the same taste that merchants did centuries ago is highly addictive! Hoi An pancakes: Nothing like the "pancakes" we know in the West, Hoi An pancakes are widely available on menus around Hoi An. Sometimes listed as "country-style pancakes", this filling appetizer is quite an interesting project. You will receive an egg omelet stuffed with veggies, a bowl of water, a plate of salad greens and mint leaves, and several sheets of hard rice paper resembling plastic! 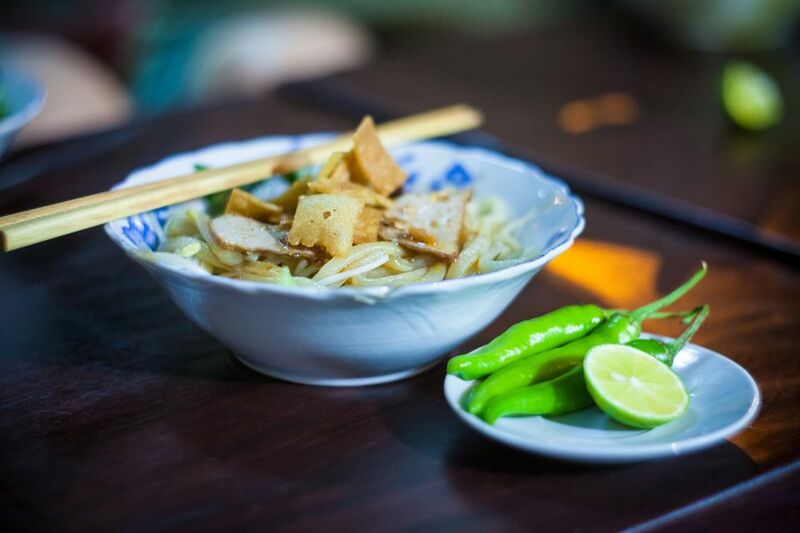 Fresh Beer: The locally-brewed beer in Hoi An is the best way to wash down your bowl of cao lau noodles. Unfortunately, restaurants do not brew the beer themselves - it is purchased in plastic bottles from local brewers daily and must be sold within 24 hours. Sometimes called "fresh beer" on signs and menus, a tall glass of the Pilsner beer is usually 25 cents or less!